A new clinical trial is underway that may help those with high blood pressure that’s resistant to other forms of treat-ment. Dr. Rodolfo Sotolongo is not only a board-certified cardiologist at Southeast Texas Cardiology Associates in Beaumont, but over the last 20 years, his Southeast Texas Clinical Research Center (SET-CRC) has been a principal investigator in more than 100 clinical trials. Clinical trials are vital to research new medical treatments and devices that may improve heart health. The trial is called the Calm-2 Study, which stands for Controlling and Lowering Blood Pressure with MobiusHD. 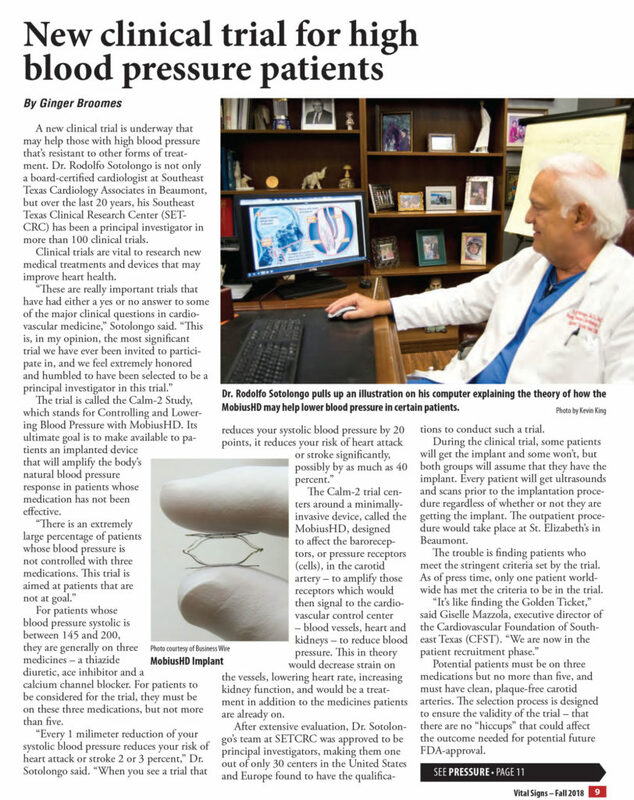 Its ultimate goal is to make available to patients an implanted device that will amplify the body’s natural blood pressure response in patients whose medication has not been effective. “There is an extremely large percentage of patients whose blood pressure is not controlled with three medications. This trial is aimed at patients that are not at goal.” For patients whose blood pressure systolic is between 145 and 200, they are generally on three medicines – a thiazide diuretic, ace inhibitor and a calcium channel blocker. For patients to be considered for the trial, they must be on these three medications, but not more than five. “Every 1 milometer reduction of your systolic blood pressure reduces your risk of heart attack or stroke 2 or 3 percent,” Dr. Sotolongo said. Read the entire article by clicking the link below.